What Are the World’s Most Nutritious Foods? 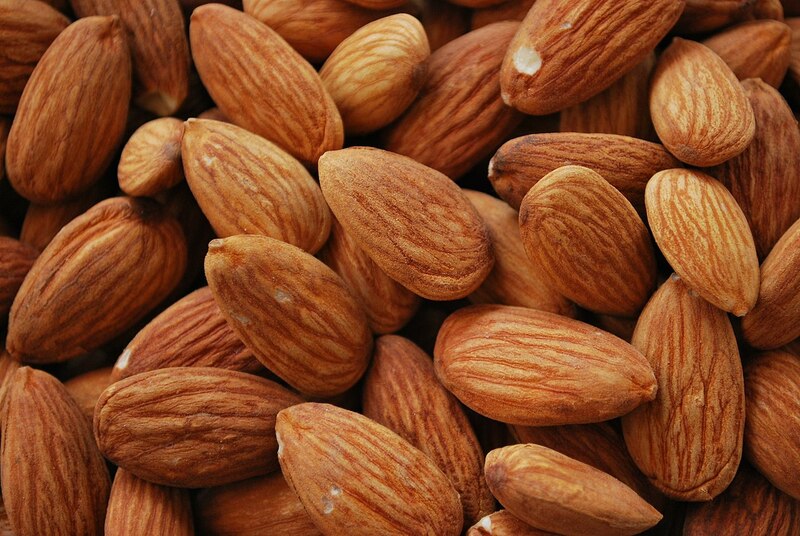 Almonds have the highest “nutritional fitness” of any raw food. The great BBC graphic and the study it’s based on assess more than 1,000 foods based on their nutrients. What are nutrients? Take a look at our reference resource for some help. A nutrient is any substance an organism needs for life, but is unable to synthesize itself. Nutrients are used in every process of an organism’s body. Some of the processes are growth (building cells), repair (healing a wound), and maintaining life (stable body temperature). The most important nutrients for plants and other autotrophs are often grouped together by the acronym CHNOPS: C (carbon), H (hydrogen), N (nitrogen), O (oxygen), P (phosphorus), and S (sulfur). Essential nutrients for heterotrophs like humans include carbohydrates, proteins, fats, vitamins, and minerals. Foods assessed in the survey were largely grouped into two categories: animal-derived foods (left) and plant-derived foods. 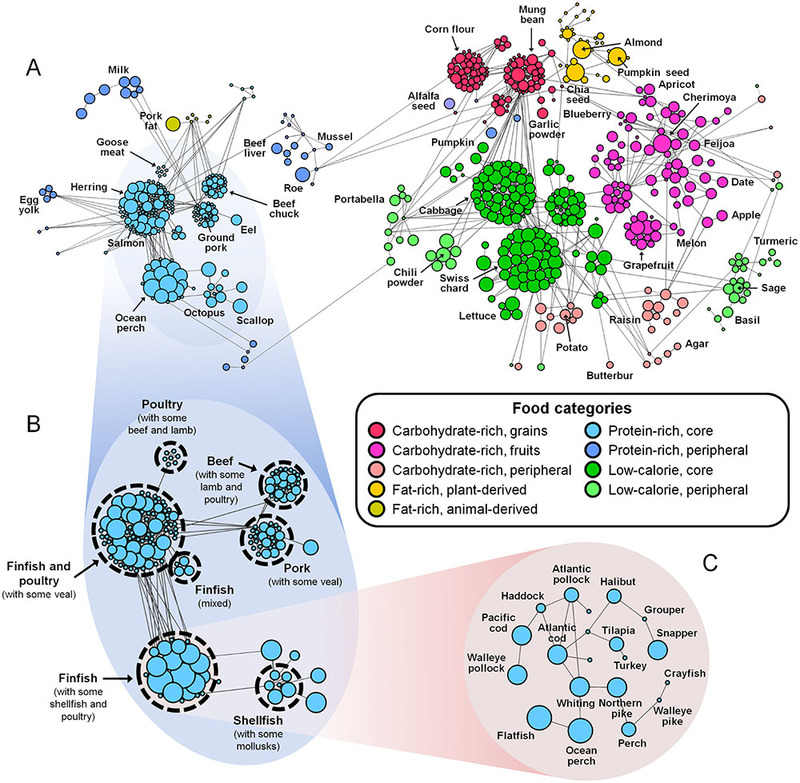 Clustered and linked foods are nutritionally similar. The study evaluated more than 1,000 foods based on their “nutritional fitness.” What is nutritional fitness? Nutritional fitness is a measurement based on a food’s “frequency of occurrence in nutritionally adequate food combinations.” It analyzes how likely each food would meet daily nutritional needs when eaten in combination with other foods. Nutritional fitness is an inclusive way of analyzing nutrition, as it puts foods in the context of other foods (what the authors call a “global network of foods”), and not in isolation. Nutritional fitness allows scientists to assess “nutrient-nutrient correlations.” These correlations express a balance of nutrients in different foods that, together, help meet nutritional requirements. The main contributors to a food’s nutritional fitness are called “bottleneck nutrients.” What are some examples of bottleneck nutrients? Bottleneck nutrients are classified in two types: favorable and unfavorable. Favorable bottleneck nutrients are those that contribute to high nutritional fitness value. Favorable bottleneck nutrients include linoleic acid, vitamin D, and choline. Unfavorable bottleneck nutrients are those that are often found in foods with low nutritional fitness value. Unfavorable bottleneck nutrients include cholesterol, manganese, and folate. The study examined the nutritional fitness of raw foods. What are raw foods? “Raw food” usually describes uncooked, unprocessed foods. (So, avocado but not guacamole.) In this study, raw food also includes frozen and dried raw foods. What are some examples of raw foods with high nutritional fitness? Scroll down the BBC graphic for some help! almonds. Almonds are rich in mono-unsaturated fatty acids, promote cardiovascular health, and may mitigate the effects of diabetes. cherimoya. Cherimoyas are a sweet tropical fruit that Mark Twain called “the most delicious fruit known to man.” Cherimoyas are rich in sugar and vitamins A, C, B1, B2, and potassium. ocean perch, also known as rose fish, red bream or redfish. Ocean perch are deepwater species indigenous to the North Atlantic, most heavily fished in the icy waters between Greenland and Iceland. Ocean perch are high in protein and low in saturated fats. FYI: Ocean perch are overfished and generally on the “Good Alternative” list of seafood to avoid. Nat Geo: What are nutrients? The link to the BBC article and graphic do not work. I tried to do some searching and could not find a correct link. Wow! Thanks for the heads-up. It looks like BBC Future took that story down; I hope it was an oversight and they re-post soon! I’ll update the link if they do. Previous Previous post: Why is the Oil Spill in the East China Sea Frustrating Scientists?